When Cammy was a young child, she was kidnapped from her home in England and taken to Shadaloo where she was brainwashed by Bison and trained as a master assassin. Cammy is a quick, fierce warrior with a "Cannon Spike" attack that makes her a deadly opponent. 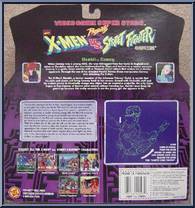 Through the use of his dreaded Psycho Power, Bison manipulates Cammy into attacking the X-Men. The X-Men's Gambit, a former member of the infamous Thieves' Guild, is certain that his style and charm will bring Cammy back to her senses. Armed with his battle staff and his mutant power to kinetically charge any object into an explosive projectile, the wily Cajun hopes to free Cammy of Bison's mind control without harming her. Gambit must keep his guard up because this crafty assassin is not the young girl she appears to be. Gambit features Kinetic Card Throw. Contribute pictures, update details or suggest corrections for Gambit vs. Cammy. 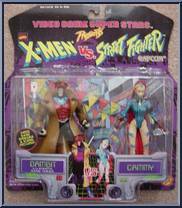 Write a review about Gambit vs. Cammy.